This is (probably) my final multi-sport race of the season, and with my legs still trashed from Ironman Canada (race report here) run two weeks previously, I decided to race in the aquabike division of the Big Kahuna Triathlon, which consists of just the swim and bike portions of that race. The Big Kahuna is a half ironman distance, so I would swim 1.2 miles and cycle 56 miles. I had to drive to Santa Cruz the day before to pick up my race packet and so to avoid traffic as much as possible, I got there just as it opened: at 10 am. It was cold! At least there wouldn't be a heat problem like I'd had in Canada two weeks ago, but I wasn't thrilled with the idea of a cold ocean swim followed by 56 miles of bike riding the cold fog in soaking-wet kit. Packet pickup took about 3 minutes, so to amortize the 45-minute drive there and 45 back, I hung out with some Silicon Valley Triathlon Club (SVTC) members for about a half hour, and then I drove home. It's amazing how doing an Ironman affects your attitude toward shorter races. I didn't take this one seriously at all, but I had confidence that there'd be no problem. It's lucky that I did look at my standard triathlon checklist considering how many things I forgot in my first half-assed packing job. The race started at 7:00 am, and my wave, the aquabike racers, all were scheduled to begin at 7:45. But with a 7:00 am start, we were required to empty the transition area at 6:45, and to set up and allow time to stand in line to take a pee, drive to Santa Cruz and park, I woke up at 4:15 am, had coffee and a bowl of cereal, and got on the road at about 4:30. By 5:45 I got to transition with all my stuff and SVTC had a rack reserved for us that was not in too bad a position: it was only about 30 or 40 feet worse than optimal. I racked my bike next to Dale, who was also doing the aquabike. There was no chance of a podium spot for me, since the aquabike had so few entrants (14 men) that they were only giving awards to the top 3 finishers, and I was second from the oldest (I'm 62 and there were men as young as 32 racing). 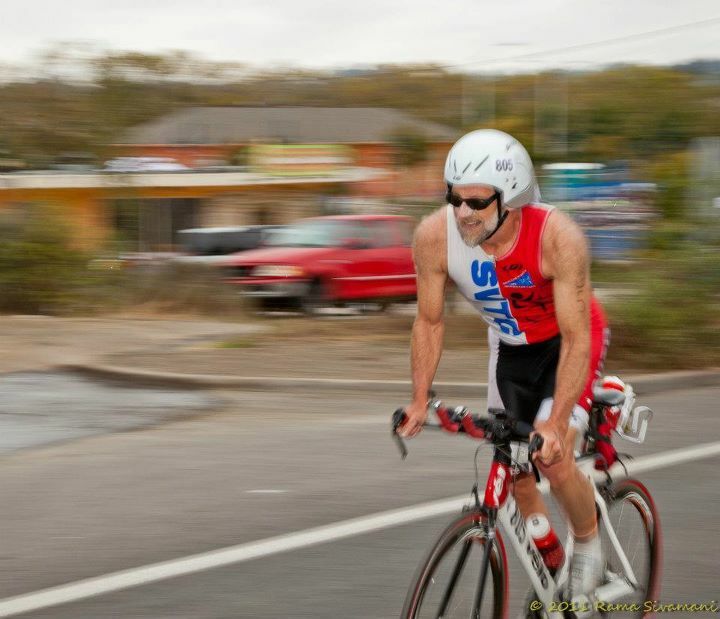 I also knew there was no chance of beating the 67-year-old man (Joe Pritchard) who I met at my previous aquabike at Vineman (race report here). There was also no hope of beating Dale who is a fabulous cyclist and approximately as fast in the water as I am. Luckily, it was warm that morning! I set up the bike, ate some Shot-Blocks, and wandered down to the starton the beach. It's a relatively long way from the water entrance and exit to the parking lot where the bikes are racked (about 500 meters), and most of it is concrete or asphalt. I hardly ever walk around barefoot so my feet are a little delicate, so I was careful on the walk down. I knew (or at least hoped) that my feet would be so cold and numbed from the swim that I wouldn't feel my feet on the run back to the bikes after the swim. That turned out to be pretty much the case, but I sure noticed that my feet were sore that night and the next morning. Some people had the sense to leave shoes near the water exit for the run to the bikes and if I race Big Kahuna again, I think I'll do that. I went for a warm-up swim and the water wasn't terribly cold, but colder than anything I've raced in so far this year. The visibility was great (no fog), and there were almost no surf. The first wave of racers started almost exactly on time (at 7:02 instead of 7:00), so my tiny aquabike wave started at 7:47. I love being in one of the final waves, since there are so many "rabbits" to catch. For the entire race, I could always pick somebody ahead of me to catch, do that, and then pick the next target. This is the exact opposite to a mass start where, after the swim where I do relatively well, I spend the rest of the time being passed by faster cyclists and runners. With such a tiny wave (14 men and 10 women) there was no chaos at the start and the only contact I had with anyone was, strangely, near the end of the swim. I was swimming next to a guy in a green cap (meaning he had started 10 minutes ahead of me) and we were heading side-by-side straight toward the swim exit, perhaps 400 meters from the beach. Suddenly, he turned across my path and I swam right over him before I realized what had happened. I kicked hard for the last 200 meters or so to try to get my blood circulating a bit in my legs. My time was great: 30:08:01! During the long run to T1 I got my wetsuit off to the waist, and once I got to my bike I changed to cycling shoes. The transition time was not great: 6:21.0, but that did include about 500 meters of jogging barefoot. Here's a photo of me taken by Rama Sivamani as I'm accelerating out of T1. There's not much to say about the bike ride: the course was well-marked and all the intersections and turns were well-controlled. The road surface was in reasonable condition and there were sufficient aid stations along the way. I waited for about 10 minutes and then started taking on fuel. I used a bottle of Cytomax and a couple of Clif Mojo Bars that I had pre-opened after my Canada experience where I had a terrible time getting one open, even using my teeth. I had a fabulous ride out to the turnaround, averaging a bit more than 20 mph, but I realized why when I turned: for the first few miles back, it felt like I was riding head-on into a high-powered wind tunnel. Although I hate riding that way, at least I knew that everybody else was, too, and most of them still had a half-marathon to run at the end, while I didn't have to hold back anything: I could afford to ride as hard as I could. The only bad part of the race was the fact that there were a lot of giant RV's, many of which were dragging SUV's behind them, and most of them made no effort to give us cyclists extra room. When each one would pass you'd be sucked out of the bike path toward them, and since I was usually concentrating on the road ahead, I was often caught by surprise. I did see one totally bizarre thing on the bike course: a rider wearing a chip and numbers, so he was in the race, texting as he rode. Needless to say, it was pretty easy to pass him! My Garmin GPS measured the course as 54.45 miles, so if that's true my average speed was 19 mph. If the official length of 56 miles is correct, I averaged 19.6. My official time was 2:51:26 for a total time of 3:27:55.3. This aquabike thing must favor older men: everybody who beat me was 46 or older and everyone I beat was 43 or younger. Maybe that means my racing age is 45 :^) I was ninth out of 14, but I was happy with the result, given my age and the age of the other racers. My cadence on the bike was pretty good, and my heart rate was almost always in zones 2 and 3, which was also according to plan. I think I could have ridden the bike portion a bit harder, but probably not enough to move up in the rankings, since I did have plenty of gas for the last few miles. After the race I walk/jogged to the aid station on the run course that was manned by SVTC volunteers and I handed out water to the runners for the next three hours. I found that my back got very sore, just standing there for such a long time. I was happy when the station closed and I could go home. The run course is also an out-and-back, and we were at approximately mile 1 and 12, so that station had to be open for the first, fastest runner at their first mile and for the last, slowest runner at their 12th. For that reason, we manned it with two shifts: 9-to-noon and noon-to-3. After cleaning up, changing, and jogging (I jogged so I could call my race a "brick") to the station, I got there barely in time for my noon shift. I sure could tell during the jog that my legs were nowhere near to recovered after Canada. I really enjoyed volunteering there: lots of friends at the station, and it was fun to cheer on the runners, especially those from SVTC. I neglected to take any extra food, so I was starving when I finally got home.